In a small saucepan, heat 1 cup reserved Pear juice to 115°F. Place heated Pear juice in a stainless steel bowl and sprinkle yeast over top. Cover and let stand 5 minutes while mixture foams. Stir yeast-juice mixture and let rest 1 minute. Stir oil and salt into yeast mixture. Add 1 1/2 cups flour and all the corn meal to yeast mixture and mix well. Stir in remaining flour in 1/4 cup intervals until dough is stiff enough to turn onto a floured surface. Knead dough 5-6 minutes, adding flour as needed. Place dough in an oiled bowl and turn over to oil top of dough ball. Cover and let double in size. Punch dough down. Divide dough into 6 even pieces. Roll each piece of dough into a thin, 10-inch oval. If desired, dough may be covered tightly and refrigerated until ready to use. If chilling, bring dough ovals to room temperature before continuing. To prepare, brush each oval lightly with olive oil and grill over medium, oiled-side down, until marked and lightly browned, about 2 minutes. Turn dough over and reduce heat to low. 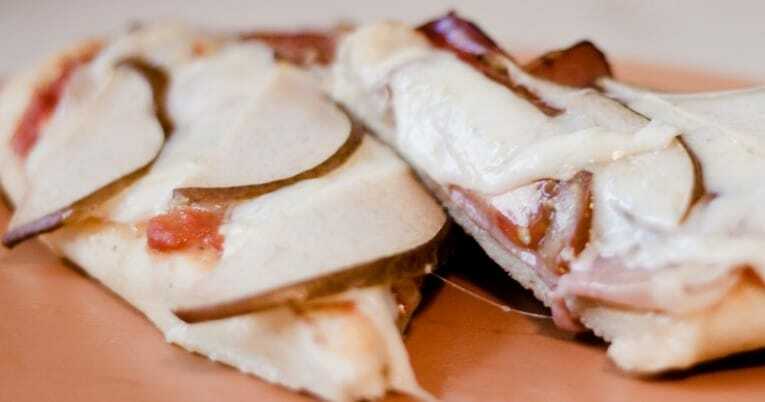 Top each flatbread with: 2 sliced Pacific Northwest Lite Canned Pear halves, 3 Tbsp. crumbled Gorgonzola, Tbsp. Prosciutto, Tbsp. Parmesan. Drizzle each topped flatbread with 1 tsp. olive oil and a sprinkling of cracked pepper and chopped rosemary. Cover grill to melt cheeses for approximately 2 minutes. Remove flatbreads from grill and let stand 3-4 minutes before cutting into wedges and serving on a board. Note: Flatbreads can be finished in oven if desired.